Actually, I would never had thought of doing author interviews if it hadn’t been for Ms. Kaska; frankly, I would not have had the courage to approach anyone and ask! But when she e-mailed me to let me know that a revised, updated version of The Sherlock Holmes Triviography and Quiz Book was in the works, she also offered herself for an interview, for which I’m very grateful, and I hope you are, too. The Sherlock Holmes Triviography and Quiz Book was originally published in 2000, and has now been reissued by LL-Publications, along with its companions, The Alfred Hitchcock and Agatha Christie Triviography and Quiz Books. It’s safe to assume, then, that you’re a mystery fan! What draws you to this particular genre? I’m an avid mystery fan. I began reading Agatha Christie and Sherlock Holmes when I was a child. I felt that I was not just reading a story, I was involved in solving a puzzle; what child doesn’t enjoy playing an adventurous game, trying to be the first to find the solution or the prize? I loved that Holmes had his magnifying glass and his very own laboratory set up in his flat on Baker Street. No wonder I pursued a career in science. Why did you choose these particular mystery icons? These three creative geniuses have always been my favorites. I had the entire Christie and Holmes collection on my bookshelf, so it seemed like a great place to begin and I knew Alfred Hitchcock, the Master of Suspense, would fit right in. I spent an entire summer watching his films in chronological order. Talk about an education; I saw how his talent evolved over his sixty-year career as a filmmaker. Studying these three icons helped immensely when I began writing my own mysteries. Can you describe your first encounter with the Great Detective? That’s an easy question to answer. It was when I read The Hound of the Baskervilles. I don’t remember how old I was, probably early teens, and I will never forget how the setting drew me in even before Holmes impressed me with his deductive reasoning. The eeriness of the moors and the terrifying idea that a bloodthirsty hound was stalking the Baskervilles seemed the most frightening thing I’d ever read. Which is your favorite canon story, and why? Do you have a least favorite, and if so, why that story in particular? Besides the Baskervilles, I really like “Silver Blaze,” which gave us the line about the “curious incident of the dog in the nighttime.” I’ll say no more as not to spoil the ending. 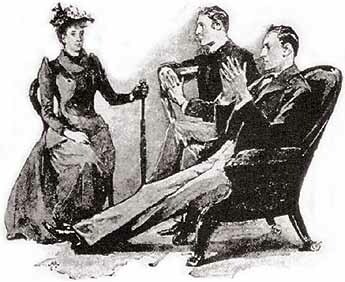 “The Musgrave Ritual” is another favorite because of the riddle Holmes had to solve, and then of course, “A Scandal in Bohemia,” where the woman, Irene Adler, beats Holmes at this own game. My least favorites are the two which were written in 3rd person and not narrated by Dr. Watson, “The Last Bow,” a spy story rather an a mystery, and “The Adventure of the Mazarin Stone,” written from an adaptation of the stage play, “The Crown Diamond.” It’s not the same when dear Dr. Watson is not telling the story. In one of your blog entries, you make a marvelous comparison between Holmes’ and Watson’s ways of dealing with the world that you call “show vs. tell,” which underlines Conan Doyle’s characterization skills. What do you like best about Doyle as a writer? She was plainly but neatly dressed, with a bright, quick face, freckled like a plover’s egg and with the brisk manner of a woman who has had her own way to make in the world. Do you read Sherlockian pastiche? If so, do you have a favorite author, book, or story, and why that one in particular? I’ve read several and I enjoy the ones that stick close to the Conan Doyle traditional style of writing Holmes. Recently, I read one of the best ones ever. It is a short story written by a fellow Sherlockian Dan Andriacco. The title is “The Peculiar Persecution of John Vincent Harden.” Had I not known its origin, I would have believed it was written by Conan Doyle. You also write your own mystery series, featuring reporter Sydney Lockhart. Would you like to tell us a little more about her and her adventures? I have so much fun with Sydney. She does and says things I would never have the nerve to say or do. She’s a tall redhead with a sassy mouth. This series, set in the early 1950s, has often been called the “hotel murder mystery” series because each one takes place in a different historic hotel. Sydney’s a reporter who can’t seem to stay out of trouble. The stories are light and humorous, but with a noir feel to them. Think of Janet Evanovich meets Raymond Chandler. Birds are another of your passions, and you have a book coming out this fall with the Univ. of Florida Press about Robert Porter Allen’s work to save the whooping crane (called, well, The Man Who Saved the Whooping Crane). How did writing non-fiction differ from your fiction work? Do you prefer one over the other? The Man Who Saved the Whooping Crane: The Robert Porter Allen Story was the most difficult book I’d ever written, but it was a labor of love. My passion for this glorious, but severely endangered bird, and learning of Bob Allen’s tireless efforts to save the species from extinction, inspired me to turn a couple of articles on the subject into a book. The reason it was so difficult is because I was writing about a real person whom I’d never met. I wanted to paint an accurate picture, not just of an ornithologist, but of a husband and a father, too. Fortunately, during my research, I located his only daughter and she was wealth of information. Bob Allen’s life full of adventures, successes, failures, but his tenacity and determination never faltered. Few people knew of his accomplishments and contributions to saving birds. I felt his story deserved to be told. I really love the trivia bits in your book. What was the most surprising fact you uncovered? The most interesting? The most interesting fact was a link between Arthur Conan Doyle and Agatha Christie. It involved her disappearance in 1926 when she drove off one evening and vanished. Her car was found abandoned in a ditch with the motor running. The entire country was on the lookout for the missing writer. 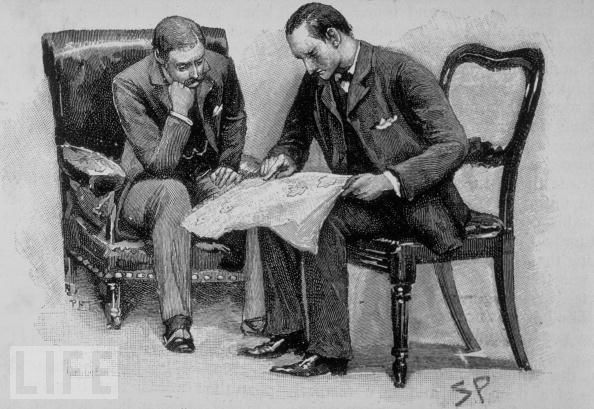 Conan Doyle was called in on the case as a consultant. He visited a medium who told him that Christie was alive and would surface the following Wednesday. The prediction came true. The odd thing was that the Christie case was similar to a Sherlock Holmes story, Conan Doyle had written a few years earlier. All that was lacking was a Hitchcock movie about this odd Christie/Conan Doyle connection. Was it difficult to come up with all of the questions in the Sherlock Holmes quizzes? Did your background in teaching science to middle-schoolers come in handy? Speaking of which…were your tests hard? My Sherlock Holmes trivia book was my third one and by this time, I knew how I wanted to structure and organize the book, so it wasn’t that difficult. As I reread the stories, I jotted down questions in a notebook. When I finished the quizzes, I researched information about Conan Doyle’s writing of each story so I could get a clearer understanding of the inspiration behind them. This was how I discovered many of the trivia bits you mention. I wouldn’t use the word difficult; my science tests were challenging. With many different learning levels in one classroom, I had to design questions for all the various leaning styles and levels. My GT students knew what I expect of them. They had additional questions, many were essay, and they knew that a few words would not be enough to get them a good grade. I love this grade level. If you give them expectations, make them accountable, give them phrase and encouragement, they will shine. I’m honored to be back here on The Well-Read Sherlockian. Your questions have given me the opportunity to elaborate on my trivia books and do a little promoting for my other writing. I hope your readers enjoy today’s post as much as I enjoyed preparing for it. Your Holmes blog is one of the best and I look forward to each and every one! You know so much about a little known world, Kathleen. It’s very different from how I approach a story–I find your angles and ways in fascinating.